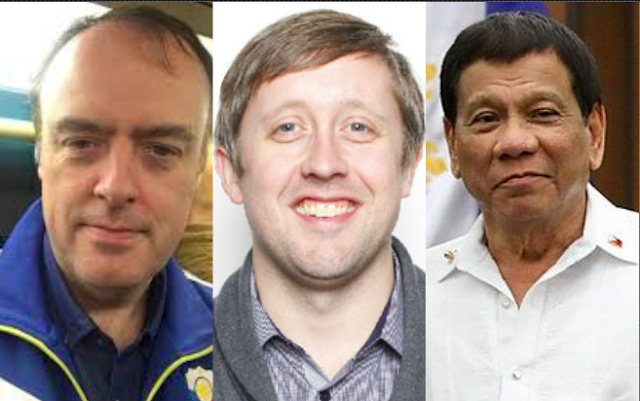 British national and Duterte supporter, Malcolm Conlan, was not impressed by the article that was written by Greg Bishop in relation to the upcoming boxing match of Manny Pacquiao and Lucas Matthysse. In his post, Conlan addressed Bishop directly, attacking the way the latter wrote the article who related the topic from Pacquiao to President Rodrigo Duterte. The first thing Conlan reitereted was that Sports Illustrated was a sports publication and therefore, according to him, should not be dealing with any political issues whatsoever. He said that it was unfair for Bishop to attack Pacquiao’s political career and stances through the article when the latter will be entering the ring as a boxer and not as a senator. He adds that amidst these criticisms and even if there are things that Pacquiao believes in that Bishop might not, this should not be an issue anyway because Pacquiao is entitled to his own opinions. Conlan said that he thinks Bishop was intentionally attacking Duterte. 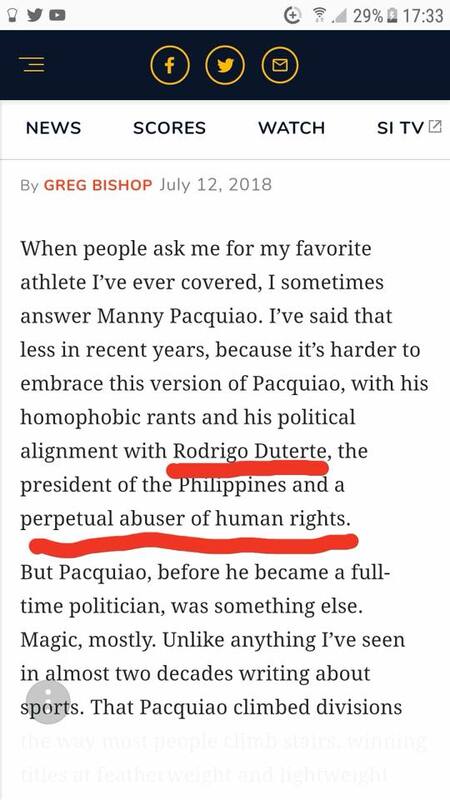 According to Conlan, Bishop mentioning President Duterte in his article was completely unnecessary, stating that the president is neither a boxer or sportsperson. This did not sit well with Conlan, saying that Bishop never even lived in the Philippines. 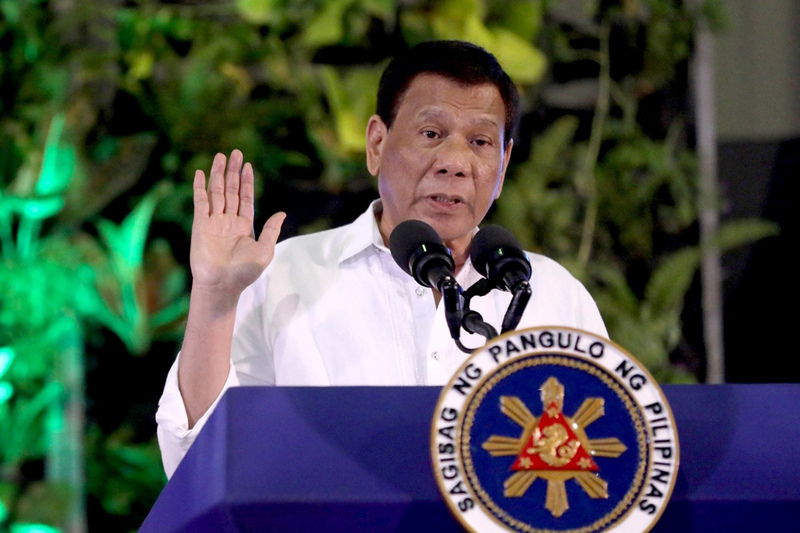 Conlan said that before Duterte took office, the Philippines had “very high crime rate, with robberies, car jackings, rapes and other such heinous crimes”. He adds that it is only Duterte who looked at the victims whom Conlan says are the real people who have been robbed of their human rights. Conlan reiterated that if Duterte did not come into power, there will be more people dying. Ending his open letter, he accuses Bishop of relying on “second hand fake news” as his source and advises Bishop to stick to sports commentary. “I believe you are simply relying on second hand fake news as the source of your insults towards him?” Conlan said. I am writing to you over your article on Manny Pacquiao and his upcoming boxing match with Lucas Matthysse. Firstly, I believe Sports Illustrated is a sports publication and not in any way connected with politics? Secondly, you are writing about a sportsman, who although happens to be a Senator in the Philippines, is not entering the boxing ring as a Senator, but as a boxer. Just because you don’t happen to agree with his political stance, doesn’t mean you can make comments about him. As much as I am not here to agree or disagree with you or cause an argument, the fact remains that as well as being a Senator, Manny Pacquiao is also a Christian and has a right to freedom of speech as well. Of course there will be some who don’t agree with all of his views, (myself included) but that doesn’t give you the right to comment on his politics as part of an article on his abilities as a boxer. Even more worrying, you seem to have totally turned your sports commentary into a political campaign against the President of the Republic of the Philippines, Rodrigo Duterte. President Duterte is not a boxer, nor sportsperson, so I don’t see any reason at all for you to make any mention of him? Particularly as your reference to him is entirely inaccurate and biased. You refer to President Duterte as a ‘perpetual abuser of human rights’. My first question is, do you live or have you ever lived in the Philippines? Do you know what it is like living In a city where there was a very high crime rate, with robberies, car jackings, rapes and other such heinous crimes? Where there were drug addicts and pushers in nearly ever barangay or village before President Duterte took office? Where young children had even been raped by drug crazed addicts out of their skull on ‘Shabu’ or crystal meth, which totally altered their state of mind? The question is sir, what about the ‘human rights’ of the victims of these wicked crimes? What about the ‘human rights’ of law abiding citizens, just trying to go to work and make a living for themselves, without fear of being robbed or worse? Whilst I am at it, have you ever met the President or heard him speak personally, can you speak Bisaya (his native dialect) or Tagalog? I can tell that I have met him and he is one of the nicest, caring, dedicated and pleasant people you could possibly wish to meet. He is certainly no monster or abuser of human rights like the western biased media including your publication chose to make out. Nothing is further from the truth. The reality is that he is a protector of human rights, with free education, reduction in crime, reduction in poverty, better laws against discrimination and the list goes on. Furthermore, I believe you are simply relying on second hand fake news as the source of your insults towards him? Sir, please stick to sports commentary as you clearly know nothing about Philippine politics or what is really happening in the Philippines.